"Sophia what would you like for Christmas?" Sophia Anderson looked up from her horse magazine to see her Mom standing in the doorway of the living room. "Spirit. I want Spirit for Christmas." Sophia said thinking of the adorable bay Mustang/quarter horse cross she rode at her riding stables. Her Mom sighed and shook her head. "Sophia, how many times have I told you we can't afford a horse and I doubt your trainer would sell Spirit." Sophia sighed and stood up. "I don't want anything then." She grabbed her magazine and hurried upstairs to her room. She had heard the same lectures hundred times and she didn't want to hear it again. She opened her bedroom door and flopped down on the bed. She glanced around her room. Her memory and cork board were full of photos of her riding on the many school horses and of course Spirit. She had model horses on her shelf and ribbons and horse pictures hanging on her walls. Her bookcase was full of horse books from fiction to training and care. She loved horses more than anything in the whole world especially Spirit. He was stubborn and sweet, spirited and sour. He and Sophia had an unbreakable bond and love for each other. 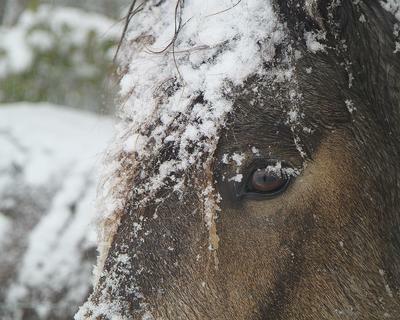 Her eyes rested on a picture of Spirit standing in the snow, Sophia holding the lead rope and standing by his side. It was only two years ago they had met and that picture held so much love and was Sophia's most special possession. "Sophia!" Her Mom called. "Your trainer called! She asked if you could come down to the barn! Spirit needs some exercise and she thought you would like to ride him!" Sophia jumped off the bed already throwing on her breeches and boots. She pulled on her coat and raced downstairs. "Lets go!" She said to her mom excitedly. "Spirit! I missed you buddy!" Sophia called as she opened the pasture gate. Spirit lifted his head and nickered a greeting as he trotted over. He nuzzled her hair affectionately. Sophia laughed and unwrapped a peppermint she had in her pocket. "Here you go," she said flattening her palm. Spirit lipped it up as Sophia put on his halter. "C'mon," she clucked and led him from the pasture up towards the barn. She clipped him on the cross-ties and began grooming him while telling him about what happened earlier that day. She finished grooming him and tacked him up. "Jane said we could take a trail ride!" Sophia said to spirit as she mounted and squeezed him to a nice steady walk. "This is our first trail out alone ever!" She guided him down the hill and turned him down her favorite trail. She loved riding in the winter. The air was cold and sometimes it even snowed. The horses' coats were thick and soft and their manes tangled. "Want to trot?" She asked Spirit as she asked him for the trot. She rose in the saddle with every other beat of the trot until they reached the best part of the trail. The long stretch she always cantered on. "Come on boy!" She clucked and nudged him into a nice steady canter. She loved to canter especially on Spirit. After about an hour out, Sophia walked Spirit up the hill back towards the barn. Jane, Sophia's trainer stood talking to a girl about Sophia's age. As Sophia halted and dismounted, Jane said to the girl, "Here is Spirit now. Would you like to try him out?" Sophia just stared. What was that supposed to mean? "Sophia, this is Samantha Evens," Jane said indicating the blond-haired girl dressed in white breeches, a navy blue riding jacket, polished tall boots and her hair in a french braid. "Samantha is looking into leasing Spirit if you don't mind her taking over and riding him for a little bit," Jane said smiling. Sophia felt her insides crushing. At her barn, when someone leased a horse it wasn't used in lessons anymore. "Umm, okay I guess." Sophia croaked and kissed Spirit's soft muzzle. Samantha snatched Spirit's reins nastily and mumbled so only Sophia could hear, "how about switching your wardrobe?" Sophia stayed at the barn until Samantha had ridden and untacked Spirit and left. Spirit stood on the cross-ties as Sophia brushed out his soft winter coat talking to him in soothing tones. It was dark outside and Sophia knew her mom would be there any moment to pick her up. "I guess I better get you back in your stall," she said and unhooked the cross-ties. She led him to his stall and opened the sliding door. She let him in, removed his halter and planted a kiss on his nose. She fed him a carrot and wrapped her arms around his neck, her eyes closed. "I'll see you in 2 days for my lesson," she said as her mom pulled up in front of the barn. "I love you." She closed the stall door and got into the car. Sophia sat at her desk that night writing as many ideas on how to get Samantha to not lease Spirit as she could. She hadn't told her mom yet and it hurt her heart at the thought of not riding Spirit for a very long time or maybe never again. She felt tears well at the back of her eyes as she looked at the picture of him on her desk. She couldn't lose him. HE was everything to her - her heart, her soulmate, her best friend, her life. Sophia jumped out of the car and hurried into the barn to check and see if she was riding Spirit. Her name was written beside his on the marker board. She smiled, grabbed his grooming tools and hurried over to his stall. He stood there, a look of love written on his face as he let out a joyful nicker. "Hey Spirit!" Sophia said and put his halter over his head. "You're so cute." She put him on the cross-ties. She glanced at her watch as she began grooming him. 15 minutes until her lesson. Perfect timing. She groomed him and picked out his hooves as she talked to him then tacked him up. After tightening his girth and checking the straps on his bridle, she put on her helmet and led him down towards the arena where her trainer was setting up a couple 14-inch cross rails. She smiled and rubbed Spirit's neck. She loved jumping. She went into the arena, checked her girth, and lengthened her stirrups before she mounted. "Go ahead and warm him up!" Jane called from the center of the arena. "Okay!" Sophia replied and began walking around the arena railing. After a couple laps, she squeezed him into a trot and began to post to the rhythm. Once she was warmed up, Jane had her work on a three-loop serpentine to get Spirit warmed up equally on both sides. "Okay, go ahead and canter." Jane said. Sophia asked for the canter and after a second Spirit transitioned into a smooth canter on the correct lead. Sophia patted him happily and began cantering a 20-meter circle. She cantered for about 15 minutes. "Okay Sophia, I want you to take him around the arena at the canter and pop over the two little cross rails over here, okay?" She nodded and began her trip around the arena. She straightened Spirit up and cantered towards the cross rails. She got into her two point and jumped over them. "Good boy!" Sophia said as she untacked Spirit after her lesson. They had jumped 2 feet for the first time together and Sophia was still boiling with excitement. The alarm clock woke Sophia up at 8:00 A.M Saturday morning. She clicked off the alarm and looked out her window. She hopped out of bed and quickly got dressed in a pair of jeans, a long sleeve blue and grey striped shirt, and her western boots. She brushed her hair, left it down, then put on some chap stick. She pulled on her navy blue hoodie and hurried into the kitchen. She grabbed a granola bar and left her Mom a note saying she was going to the barn to see if there was any work to be done and hurried outside to grab her bike. She loved riding her bike to the barn early in the morning. The air was cool, the scent was heavenly, and of course she was going to the barn which was the best part. She pulled into the long driveway of her stables and parked her bike beside the barn. "G'morning Jane!" Sophia called happily as her trainer walked into the barn. "Oh hey Sophia, come to help out and visit Spirit?" She asked smiling. Sophia nodded. "OK, well Samantha is coming to ride Spirit again but if you want to work on cleaning some tack and stalls for a couple hours you can hang out with Spirit when you're done." Sophia nodded and went into the tack room to start cleaning the saddles. Sophia looked up from her dinner to see her Mom looking at her. "What's bugging you? Ever since the day you were at the barn exercising Spirit you've been acting weird." "Nothing's wrong. I guess I'm just excited about Christmas." She lied and took a sip of her water hoping that would end the conversation. "Hmm, okay." Her Mom replied and went back to her dinner. Quickly, Sophia made her way up the stairs. She had just finished dinner and helped her Mom clean up and wanted to get to her room to plan the "lease problem" as she called it. She entered her room, closed the door and sat down at her desk. Pulling a notebook out of her desk drawer and a pen, she began brainstorming. At the top of the page, she wrote "lease problem" and started thinking of what she could do. A few minutes later it hit her. She knew exactly what to do. Now all she had to do was go to the barn the same day as Samantha was going to ride. Sophia leaned up against the wall of Queen's stall, a skewbald paint mare. Samantha was about to walk into Spirit's stall who was covered in red mud, manure stains and hay. She slipped out of the stall and made herself look busy by chipping some ice out of Queen's water bucket. Samantha walked into the barn and scoffed at Sophia as she opened the stall door. The next moment, Samantha stifled a scream. Sophia smirked and peeked into the stall. "Everything all right in there Samantha?" The rude girl whirled around glaring at her. "This.. this horse! What did you do to him? He's horrid looking!" "I didn't do anything!" Sophia said in mock exasperation. "He rolls didn't you know that?" She said which was a hundred percent true. "Well, I can't afford to get my new white breeches dirty. Groom him, will you?" She growled and whirled out of the stall. "I HATE THIS ANIMAL!" Samantha shrieked as she dismounted, dropped the reins and glared at Jane. Spirit trotted off startled by the noise. Hopping off of the fence, Sophia grabbed his reins and pet his neck lovingly. "It's OK boy." She said smiling. "Sophia!" Jane called and started towards her. "Samantha give Sophia your helmet. Sophia get on Spirit and show Samantha how good of an animal Spirit is." Shocked, Sophia put the helmet on, adjusted her stirrups and mounted. Since he was already warmed up, she asked him for the trot which he picked up immediately .She trotted for a few minutes and then brought him into the canter. It was working! The lease problem was coming to an end! Thank you all for the wonderful comments! I know this is kind of a Christmas story and I would like to finish it before then but I'm just really busy and it will probably not be finished until January! Sydney, I feel that way with Peppy and he is my inspiration for the story. Merry Christmas and a happy new year to all of you and horses you love, own, know, etc. "Get out of the stall, you little brat!" Samantha hissed to Sophia, who was grooming Spirit. "You were late so Jane wanted me to start grooming him." Sophia replied tightly and planted a kiss on Spirit's nose. "I love you Spirit, after your lesson how about a nice bath and some hand grazing and treats?" Spirit pricked his ears and nuzzled the top of Sophia's hair. "Why on earth do you want to hang out at the stable with a horse?" Samantha sneered and grabbed the brush from Sophia. Sophia slowly walked out of the stall and began cleaning stalls. About 10 minutes later, Samantha led Spirit out of his stall and walked down to the arena. Sophia followed figuring she would take a break and watch some of the lesson. Samantha turned out to be a worse rider than Sophia imagined. Her reins were too long and her heels were not down. Her posting needed some work and she was on the wrong diagonal almost the whole time. "Poor Spirit." Sophia mumbled, watching as he trotted around slowly his ears back and Samantha pulling his head up. Sophia had to keep the lease from happening. She just had to. I've felt like that about a horse I've fallen in love with that wasn't mine. You captured the feeling exactly. Keep writing! Two more parts just written and on the way! I'm so glad you guys like my story! I love your story! Keep it up!